Dr. Wootton teaches fundamental courses in mechanics and mechanical engineering (fluid and solid mechanics, engineering mechanics/dynamics), and bioengineering electives (Biotransport, Injury Biomechanics and Safety, Tissue Engineering). He has advised a variety projects for seniors, freshmen, master’s degree, and independent studies, including: exercise equipment for overweight teens; experimental systems for impact injury, bone interference screw strength, knee mechanics, and upper airway mechanics; folding bicycle design; microchannel blood platelet inhibition assay; bone and osteochondral tissue engineering scaffold manufacturing; bone interference screw testing, and atomic force microscopy. Dr. Wootton’s main research interests are biofluid and biosolid mechanics and biotransport modeling, Current research projects in this area include magnetic resonance image-based upper airway fluid and solid mechanics models to better understand anatomic and neuromuscular factors contributing to obstructive sleep apnea syndrome, and novel (often CAD/CAM based) manufacturing methods for tissue engineering scaffolds and constructs. His past studies in this area include models of flow, near-wall platelet concentration, and platelet accumulation in arterial thrombosis, which linked the flow field features typically found in advanced atherosclerosis (artery disease) with the enhanced rate of blood clot formation (thrombosis) associated with many heart attacks and strokes. He also developed an experimental and computational model of thrombolytic (“clot-busting”) drug therapy in remnants of thrombus adhering to a vessel wall after blood flow is reestablished. His research is currently supported by federal grants from the National Institutes of Health and National Science Foundation, and he has been supported by the American Heart Association. Dr. Wootton is also interested in introducing novel experiments and demonstrations in the engineering curriculum, and participates in an NSF-sponsored project to bring microfluidics experiments into the introductory courses in fluid mechanics and Biotransport. He is collaborating with Professor Delegrammatikas and Cooper Alum and ME lab manager John Consiglio to introduce particle image velocimetry (PIV) to undergraduate student courses and projects (funded by NSF). 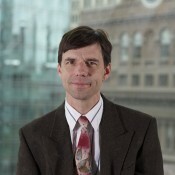 Dr. Wootton studied Mechanical Engineering Cornell University (BS 1987), MIT (MS 1990), and Georgia Tech (PhD 1998), and Biomedical Engineering at Georgia Tech (PhD subject area) and Johns Hopkins University (Postdoc 1998-2000). His professional experience includes Crashworthiness and Safety Engineering at General Motors, environmental noise and vibration (Harris Miller Miller and Hanson), and musical instrument repair and restoration (Reuning and Son Violins).